All was great . We discovered a universe that needs to be preserved. The trip was great – both the Extended Full Circuit itinerary and Swoop’s selection of the best local partner to support us were good. I am actually going to go on a quest to try to convince all of my outdoorsy friends that this is a must do – and categorically recommend Swoop. The only thing I would suggest (which may work for some others like us who only spend 2 weeks there) would be to advertise a Torres De Paine Full Circuit with an El Chalten leg. This is what we ended up doing, with a night in El Calafate in between. The two places are close enough and it ended up being absolutely the best, since you see El Chalten (Fitz Roy, Cerro Tore, etc) and the Torres Del Paine Circuit. The other thing I would suggest is to try to promote the Torres de Paine Full Circuit more, since it is different (and way better in my opinion) than just the W Trek. There are places like Dickson, Perros, El Paso, the view of Grey Glacier from El Paso that are ‘once in a lifetime’, and a simple W Trek does not include those. 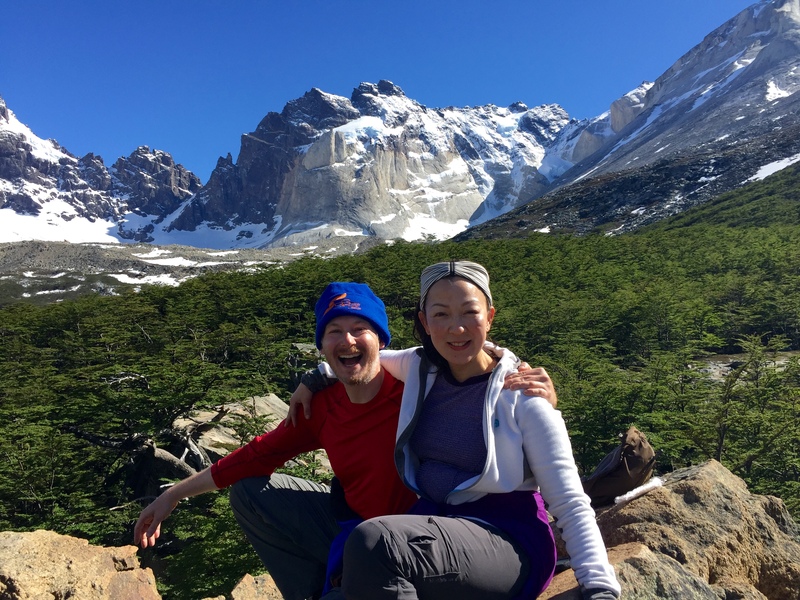 They are great – Laura was so great to accommodate a last minute change (quite radical actually, as we wanted to include El Chalten on the Friday before the trip). Our guide, Nico, was not only a world class climber, but also ended up being like family! He was very knowledgeable, passionate, and in love with Patagonia. Dario was of the same caliber also- they were some of the best guides we used. We could not have been treated better, honestly. For me, every day was special, really. I cannot pinpoint to one unique highlight – Patagonia creates in you a state of inner peace that takes over everything that you experience. Really special. The only other part of Argentina we saw was a ½ day in Buenos Aires. Very pretty, highly recommended if you have a long enough layover. And the bus system is so great that you don’t even need to hire taxis from the airport to the city centre, nor to rent a locker in the airport. The bus system offers all, for very very convenient price (we ended up storing our backpacks for a day for 30 Argentinian pesos, both – the equivalent of 3 UDS – not bad for 2 big backpacks! Thank you again for organising such an amazing trip, it was wonderful indeed. 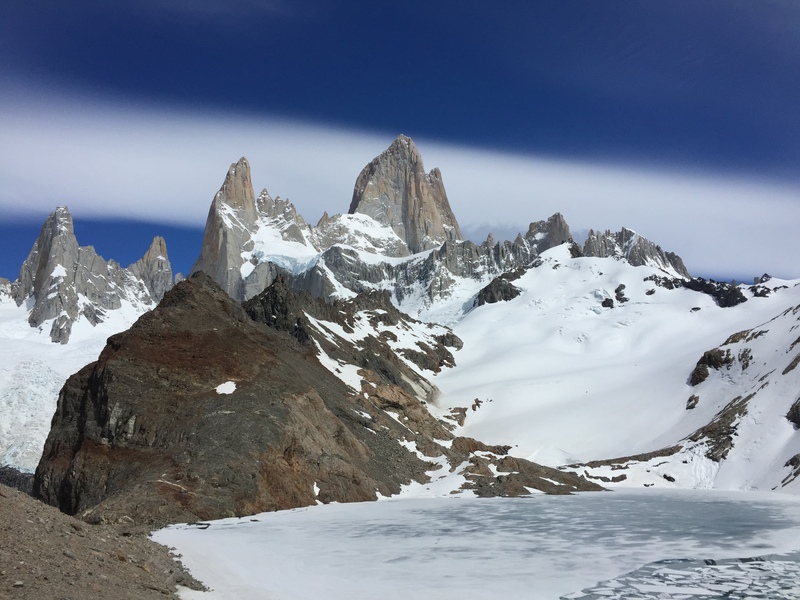 This entry was posted in Los Glaciares, Reviews, Torres del Paine and tagged Dittmar, Extended Paine Circuit, Full_Circuit, Guides, Hiking, Tips on 9th April 2015 by Luke Errington. How was your experience of booking your trip with Swoop Patagonia? We had a great time on our trip with Swoop- it was the highlight of our honeymoon in Chile for sure! What did you think of your W Trek Itinerary? We would definitely recommend the Camping W Trek to family and friends who are in very good physical shape (we both found the hiking to be challenging, but manageable). We got very lucky with the weather and were astounded by the beauty of the park. How was your guide on the trip? Our guide, Mauricio was extremely skilled and knowledgeable, and a great photographer as well! The meals were good, and my husband and I enjoyed great vegetarian food the whole time. Do you have any recommendations for us that would have improved your experience? I think my only recommendation would be to have more ways to tailor the trip for less experienced hikers (i.e. more down time, factoring in more time for the hikes to take pictures). Some of this is really just because I felt I could have spent hours at the lookouts, which isn’t totally possible, but I wonder if it would be possible to get a bit more time to take it all in, as the sights were truly overwhelming and unreal. Overall however, everything was great. We also went to Santiago, Vina del mar and Valparaiso, and were able to go to Isla Magdalena to see the Penguins when we were back in Punta Arenas. Thank you for helping us to plan and arrange this fantastic experience! This entry was posted in Reviews, Torres del Paine and tagged camping, Dittmar, food, Guides, honeymoon, Torres_del_Paine, W_Circuit, weather on 2nd February 2015 by Luke Errington. How did you find Swoop and our partners? I would recommend both Swoop and your partners. I thought your partners in Torres del Paine were great and definitely went beyond the extra mile to help! Their staff were excellent, especially in Chile- super enthusiastic and helpful. What did you think of your itinerary, is there anything you would change about it? The Mountain Biking was harder than we expected, and actually, for the non-mountain biker, was probably more of a day trip. The walking part of the trip was brilliant – fantastic advice – we could not fault this part of the trip. I only wish that day 2 could have been longer so that we could have made the whole of the French Valley on day 3. The boat trip at the end of day 3 was a tight squeeze – it might be worth warning people to arrive early – we nearly didn’t get on and it would have been another hour’s wait until the next one! How was the accommodation on your trip? We managed on two nights out of three in the refugios once we were there. Lago Grey hotel was a bit chaotic – they kept trying to charge us for pre-booked meals and refused to provide lunch boxes as we had not booked excursions – so bit of a shambles! The hotel itself was lovely, and the staff were very friendly, just rather confused! 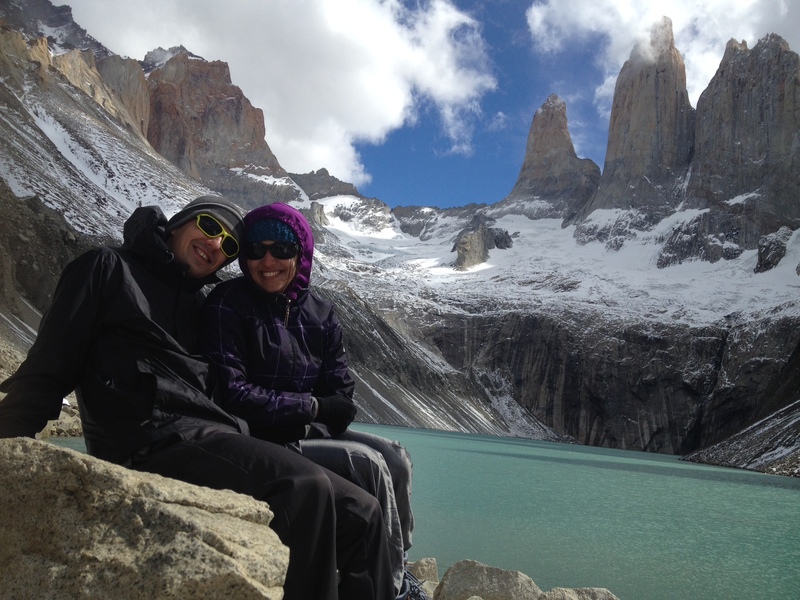 Our highlight was the hike on day 1 up to Torres Del Paine – this was on my bucket list!! 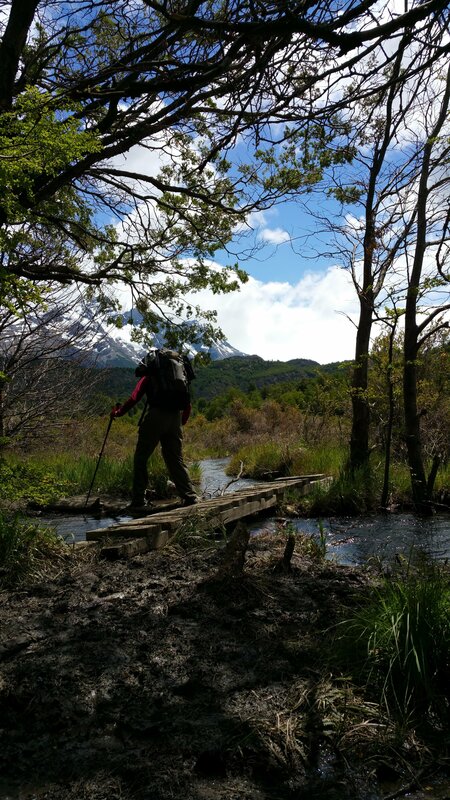 This entry was posted in Reviews, Torres del Paine and tagged Dittmar, Hiking, kayaking, mountain_biking, Multi Activity, refugios, Torres_del_Paine, W_Circuit on 16th January 2015 by Luke Errington. I was really happy with the prompt and personable way in which Swoop responded to all my questions. 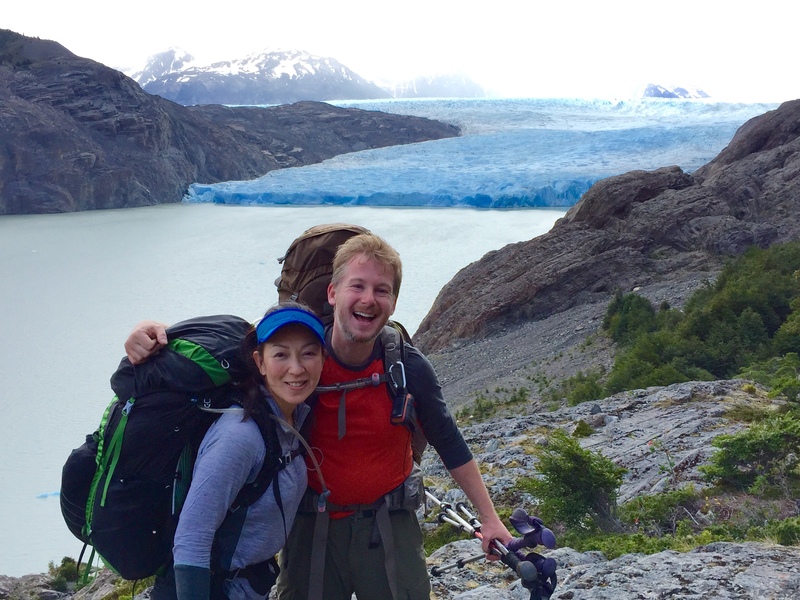 I also really liked the fact that Luke was able to secure a private trip with one of their partners in Torres del Paine for a competitive price, despite the fact that we only had three people in our party. We loved the fact that Swoop and their partners found other people to join us so that we could eventually do this trip as a group of what turned out to be five very compatible people. I have no suggestions and I will most certainly recommend you to anyone considering going to Patagonia. Also great! Laura did a wonderful job taking care of the logistics, and we also liked the company she chose for our penguin excursion. We felt very spoiled that all the thinking and organising had already been done for us. Justin, our guide, was fantastic: knowledgeable, professional and a great guy to get to know better. We all enjoyed each other’s company. The itinerary was well thought-out, in retrospect, and we got lucky with the weather relative to that itinerary. For instance, the kayaking trip happened to work out during the morning that it was planned for, but would not have been possible the day before or the afternoon after. The 5th day involved crossing the John Garner pass and – rather than continuing on to Grey – we stayed at Paso. That seemed at first to be a needless stop, since we got to the (cold and rainy and very basic) camp early in the afternoon. However, we appreciated the extra day when we realised that the next part – though not terribly long – did involve a lot of steep downhill. We could have continued on, but would have enjoyed that section less if we had crammed it in the previous day. Moreover, it gave us another day in the backcountry, which was the best part of the trip! How were your meals on the trip? I don’t think anyone has much control over the food. It’s a wonderbread-country 😉 and the lack of competition among suppliers did not seem to encourage them to provide any great lunches. Some were REALLY awful and pretty minimal for a full day of hiking. A particularly cynical inclusion was a bottle of water in our lunch bag from ‘Fantastico Sur’. Really? However, I can’t blame Swoop’s partners, Justin (our guide) or Swoop of course for any of that. We survived. It’s hard to point at one highlight. What made the trip so special was that we truly enjoyed every day. Having a guide (and porters for part of the time) was a really great idea. It took all the worrying and second-guessing out of it, for one thing. This entry was posted in Reviews, Torres del Paine and tagged accommodation, Dittmar, food, Full_Circuit, Guides, Torres_del_Paine on 16th January 2015 by Luke Errington. Swoop’s partners were also very good. Their correspondence was very good, with consistently rapid and helpful responses. We had a small hiccup with buses at the airport and they sorted us out very quickly. What did you think of the Half and Half Circuit Itinerary? The Half and Half itinerary was great, we at first thought it was going to be slow with only a few hours a day but in the end we really enjoyed that we were not rushing the hike and felt like we got to know the mountains really well. Our guide Nico was really good, very patient, easy to chat too and helpful. The porters were also really nice guys. What did you think of the accommodation on the Circuit route? The facilities were more modern than expected, we were expecting huts and we got country houses for half the trip but we loved the more basic huts at the back of the Torres circuit. We would recommend the hired tents in the W to be selected by the lengths, my husband is 1m80cm and lying in a tent that is 1.70-1.80 was quite uncomfortable for him and we had 3 nights like this in a row. The tent brought in by Swoop’s partners for the remainder of the trek was good, the recommendation here would be for them to get additional ground sheets as the damp seeped through to our mats and belongings on the tent floor. Afterwards we went onto visit Perito Moreno glacier, the Fitz Roy range and then onto Mendoza and Buenos Aires before returning back to Brazil. The whole trip was a highlight. We had a really good time and we got on with all the group members very well. We were blessed with good weather for 9 out of 10 of the days, which made a huge difference to the trip! The winds stayed away after day 1 so we were all really happy. 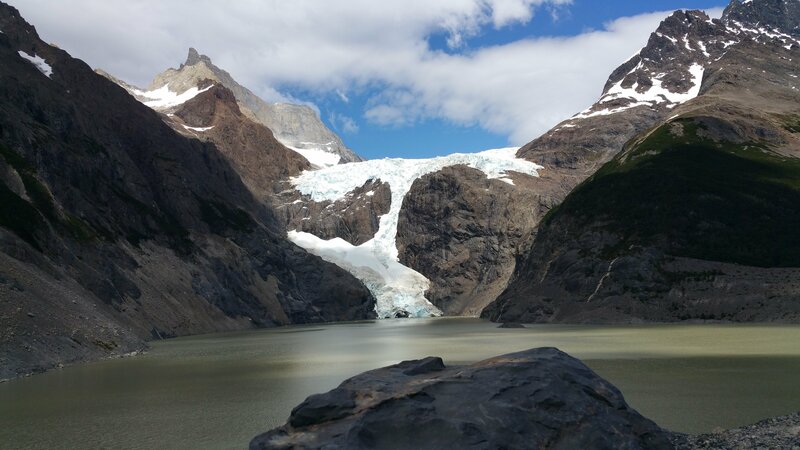 This entry was posted in Reviews, Torres del Paine and tagged accommodation, Dittmar, Full_Circuit, Guides, Torres_del_Paine, Trekking, weather on 31st December 2014 by Luke Errington. I have visited and guided in Patagonia on 13 or more occasions over the last 20 plus years… I love it! Having already asked a good friend of mine (from one of the biggest and most expensive trekking companies) about the possibility of doing hiking in El Chalten with no reply, I accidentally stumbled across Swoop Patagonia during a Google search. They immediately resonated with me, particularly given the feedback from previous customers on their blog, and the fact that they specialise in, and seemed extremely knowledgeable about all things Patagonia. My experience post trip does indeed confirm that Swoop Patagonia is now my one-stop-shop for locating and linking me to suitable outfitters in Patagonia, so much so that I have already recommended them to my older brother over and above the expensive (non-responsive) opposition that thought it had the lion’s share of the market…! Correspondence with Swoop was and is very fast and accurate, and saved me a lot of worry about things like connections, transfers, and what would be the best ‘tailored’ experience for me. How was your experience with Swoop’s partners in Chalten for the Gorra Blanca Ascent? These ‘new’ small outfitters seemed very knowledgeable about the Fitzroy area and the appropriateness of difficulty grades and things to do. The team, probably had no idea that I had a long association with and knowledge about the area, already knowing what I wanted and where I wanted to go. Their suggestion of attempting Gorra Blanca (a mountain that I had passed many times before, but never considered) was novel, and in the time I had available, pretty spot on. I feel that these outfitters have a great and expanding client base. I will, and have already, crowed about their services – again over and above the other trekking company I had previous connections with. The guide also had no idea of my background and capabilities, but we soon sorted that out and bonded extremely well. I have to say I was impressed (and I’m not easily impressed) with his professionalism and decision-making. I was not the ‘normal’ client, and with potentially intimidating credentials he made safe and responsible decisions – looking after both our wellbeing. We did in the small amount of time available the most humanly possible… and they even turned on the ‘good’ weather and stopped the winds and rain. I will be writing separately and sending a good show award type letter separately. 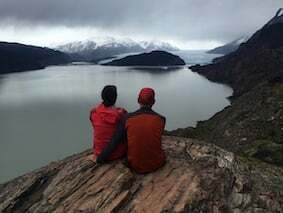 How was your experience with Swoop’s partners in Torres del Paine for the Avid Hikers Circuit? Laura and her team in Torres del Paine were likewise very responsive to e-mails and the organising of bus connections and all my detailed niggling. I reckon that I’m a pain in the arse as a client and I wanted (demanded) that things had to be spot on because of my tight itinerary revolving around my Antarctic climbing trip. They suggested a modified, more interesting, and not so often undertaken variation on the famous W Circuit. This proved to be a winner and again the weather Gods shone on the team and trip. The guide and guide and porter provided were likewise very capable and professional. The small team of 4 (2 clients and 2 staff members) quickly bonded. The itinerary, food, and mixture of tent versus Refugio was also an up-market and relaxing way to go. Of course I will be recommending this organisation and the guides here also. 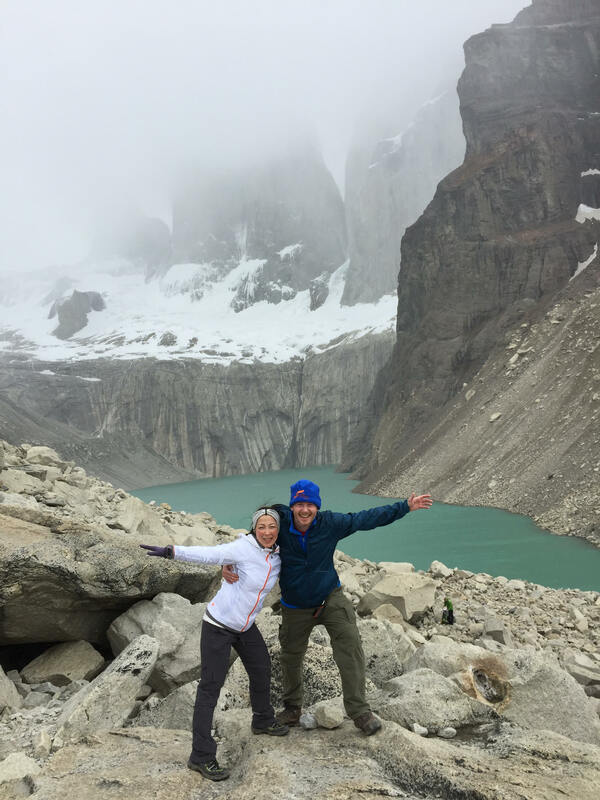 This entry was posted in Los Glaciares, Reviews, Torres del Paine and tagged accommodation, Dittmar, gorra blanca, Guides, Hiking, Los_Glaciares, serac, Torres_del_Paine, W_Circuit on 30th December 2014 by Luke Errington. 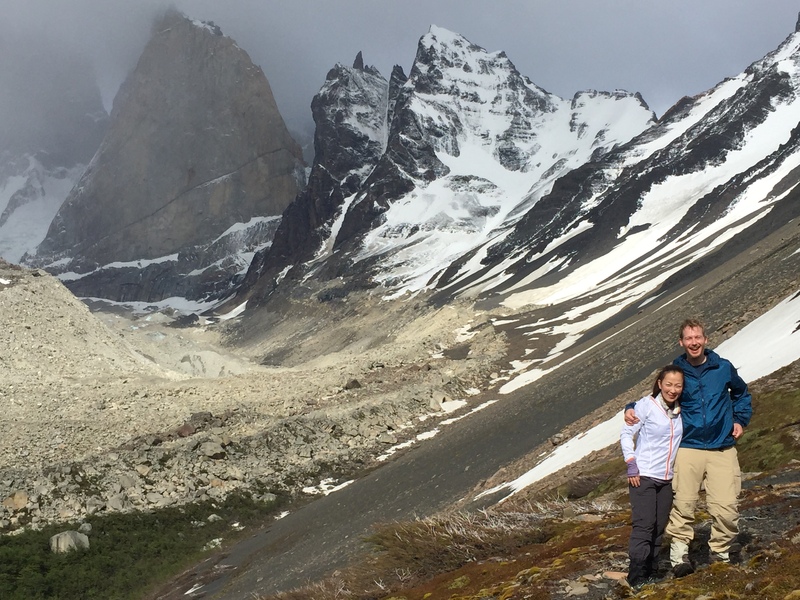 How were Swoop’s local partners in Torres del Paine and Los Glaciares? Both of your partners were great. We really impressed with one of the Torres del Paine team who picked us up at the bus station in Puerto Natales with Justin (our guide) and also dropped us off at the bus station afterwards. After arriving, we had a meeting with Justin at the restaurant across from our hostel, and straight away knew we were going to be in good hands. How did you enjoy your itineraries? Our itinerary was awesome! I’m glad that we started the first leg in Torres Del Paine. The part that we loved the most was our second day hiking Oggioni Pass. Swoop’s Torres del Paine partner provided an additional guide for us- it was the hardest day but it turned out to be the most memorable of our entire trip. Our guides for our first few days in Chile were Justin and Niko- they were the best ever. They were extremely safe and knowledgeable, and assisted me with some scary river crossings by helping me with my pack, and reassuring me. For the remainder of our trip, we had a guide called Justin who was also very accommodating. My boyfriend has dietary restrictions, so he ended up cooking food in two batches every time we stayed at the campsite, which was very helpful. 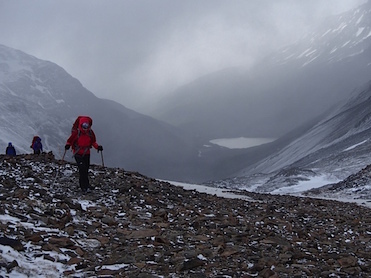 Yes, we would love to change one thing; take four days off the beaten path and skip walking on Viedma Glacier. The boat ride was fun, but it was too touristy which is not our cup of tea. Be prepared to hike in very strong wind conditions, and accept not being able to predict the weather. Make yourself physically fit for what you have signed up for, ensure you bring the proper gear. Yes, we spent 3 days in Buenos Aires before flying back to the States, there are tons of good restaurants there! Thanks a million to Chloe, Luke, Sally & the rest of the Swoop staff for helping us organise such a memorable trip. We can’t wait to go back to do more trip like hiking across the glacier! This entry was posted in Reviews, Torres del Paine and tagged Dittmar, food, Guides, Los_Glaciares, Tips, Torres_del_Paine, Walk Patagonia, weather on 22nd December 2014 by Luke Errington. We were extremely blessed with the weather, as we only experienced rain once throughout the entire trek, and that was during the evening, whilst we were asleep. 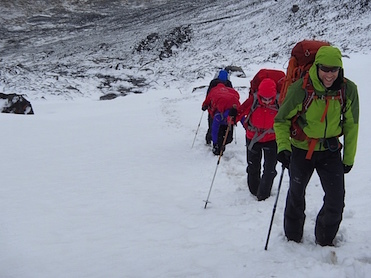 The group of people that we hiked with were great – we spent10 days together and there were no real niggles. Our equipment worked really well, the guide your partners arranged was an amazing individual with a high level of professionalism, and the porters were rock solid. We ate amazing meals for the two days in Puerto Natales after the trip, on recommendation of your partners who ran the trip: Aldea and the Red Crab. Great food next time you are in town. On a down note – and beyond your control – we had everything that could go wrong with the flights go wrong…Luckily we had such a great trip that this is only a minor distraction! I’d like to extend a big thank you to Swoop for the great work you did for us and for making our time work so well. We had an amazing experience and feel lucky that we came across your company online. 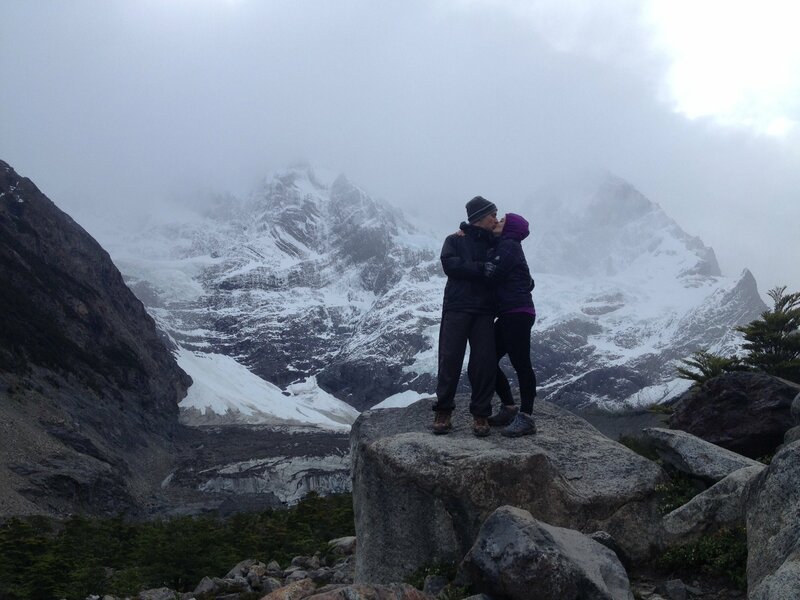 You and your partner in Torres del Paine helped make the ground part of this trip run extremely well. Thank you. 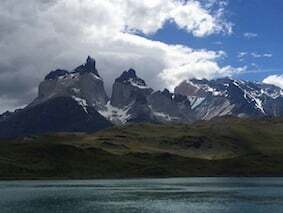 This entry was posted in Reviews, Torres del Paine and tagged Dittmar, Full_Circuit, Torres_del_Paine, Trekking, weather on 5th December 2014 by Luke Errington. 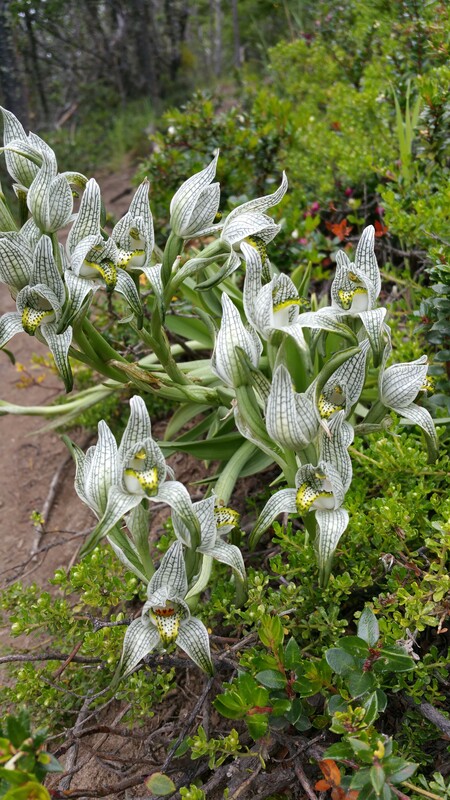 We really appreciate you putting us in contact with your partners in Torres del Paine directly. That was super-helpful, in particular given the short timeframe we had to organize this. Just based on this, you clearly differentiated yourself from others. Your partners organised an amazing trek for us! We never went up to Japones, as the Torres campsite was open and perfectly secluded in the woods. Next time, we would probably keep our guide another day, go to Campamento Italiano and skip Los Cuernos – it was just too crowded there. Once we arrived at Paine Grande, it felt like a 4-star hotel ;-). It was a great, great trip!! We saw sooo much, and were incredibly lucky with the weather – our rain gear never had to come out once. The transfers in and out also worked very well – even though the bus ride is very long. We would always cut out the loop via Puerto Natales again though. Carlos, our guide, did a truly amazing job!! He is very knowledgeable about flora and fauna, but also knew many anecdotes about how the names of the lagoons and peaks came about and changed over time… We really enjoyed that!! 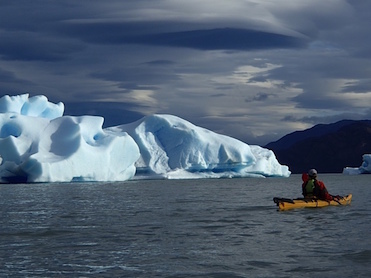 Once back in El Calafate, we had independently planned to do the kayaking at the Upsala glacier, but even though we had paid for this (almost AR$ 6,000 (!!) for the two of us), the travel agent we used (Not Swoop) lost our reservation and never came to pick us up on Saturday morning. That was very disappointing that we missed that trip. We have since investigated this ourselves and been informed by various hotels and other agents that they all avoid working with the company we used, even though they are the only ones that offer this trip from Calafate and are also the ones doing Estancia Cristina – this company is apparently known for making this kind of mistakes and mishaps. This entry was posted in Reviews, Torres del Paine and tagged Dittmar, Guides, Torres_del_Paine, Trekking on 5th December 2014 by Luke Errington. What was your experience of planning and arranging your trip with Swoop? Speaking for Susan and myself, I think that the most important point in terms of the structure of the trip was that it worked very well. I believe that there are certainly logistical and language issues with a trip such as this, and I feel that the arrangements made by Swoop and the other operators were well worth the money. Having self-arranged trips elsewhere in the world, at least 5 times previously, going via Swoop was a different structure, and I would encourage others to do likewise, especially with potential language issues. In El Chalten, we were pleasantly surprised that a small village of its size has the amenities that it does. Nothing like walking into the Mirador for Fitzroy, and walking out to enjoy a pint at the microbrewery, followed by a great restaurant meal, and a good sleep at Kaulem. For me, El Chalten was the highlight, given the total surprise at what we had expected for facilities, and the relative ease at getting into the objectives. The cruise was wonderful; great meals, wonderful tablemates, very knowledgeable interpreters. The choice of a berth in the lower deck was the right one, given the rough seas, going towards Cape Horn. Swoop is commended for recommending Parc Nationale los Glaciares; this was a highlight also. 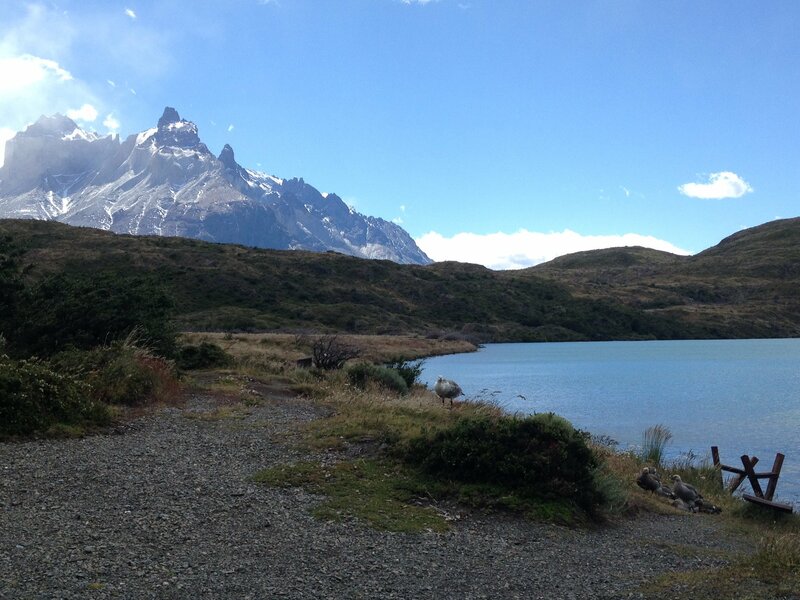 How did you find the Trekking in Torres del Paine & Chalten? I would not describe the “W Trek” as a life-changing experience. Having hiked, scrambled, and climbed in the Canadian Rockies for 35 years I guess I have been spoiled. The trails in both countries are well maintained and clean; the daily itinerary was very do-able, for people of our age and relative fitness. We found the Refugio staff to be less than helpful, not at all service based, and the meals monotonous and of dubious quality, especially some of the vegetarian options. I certainly think these young people could learn a lesson about guest expectations and service from the folks at Palermo, and on the Cruise. I picked up bed bugs at one of the Refugios as well. Could they not charge a little more, and offer a little more? On the ground , we found your partners in Torres del Paine very helpful and a good resource, although we also took in the 3:00 p.m. talk at Erratic Rock. She could do with a little more prominent sign. How were your other accommodations during the trip? In Buenos Aires, we found the Palermo Hotel and its concierge service quite exceptional. We are not normally effusive in our praise, but Luke really picked a winner here. The facility in El Calafate was unexceptional, no strong memories, one way or the other. In Chile, the people at both Erratic Rock were helpful, and it was appreciated that they held our spare kit while we were elsewhere (as did Palermo, in Buenos Aires). The B&B in Punta Arenas could have been better. We were in side by side rooms, nearby the upstairs dining area. Noise from the front desk carried, the staff seemed to be oblivious to their all night “yakking” and then the German group got up (or maybe never went to bed) at 4:00 a.m. or so, to have breakfast. So, a real lack of commitment to other guests, and I’d encourage you to find something smaller, and quieter. In conclusion, a well planned and well organized trip, for which considerable recognition should also go to my wife, Susan, as well. I really think her secret job is also tour operating, and should you have any vacancies, please keep her in mind! This is a trip we have been working on since we read Bruce Chatwins’ book, “In Patagonia”, in approximately 1980. We still have the book, and brought it along to reread. Then, we were poor University students and all we could afford was “armchair travelling”. So, 34 years later and the circle closes. We have fulfilled one of our dreams as a couple, between armchair and wheelchair, I guess you’d say. Thank you, once again, for the effort. Cheers! Larry. This entry was posted in Cruise, Los Glaciares, Reviews, Torres del Paine and tagged accommodation, Chalten, Cruceros_Australis, Cruise, Dittmar, FitzRoy, food, Hiking, Los_Glaciares, Punta_Arenas, refugios, Torres_del_Paine, Walk Patagonia on 13th June 2014 by Luke Errington.